First of all, if you know what FCBD is, then you're halfway to VIP Status! All it takes is signing up. And that's easier than lifting Thor's hammer. Sign up in the shop or print the form and drop it off on your next visit to the shop. 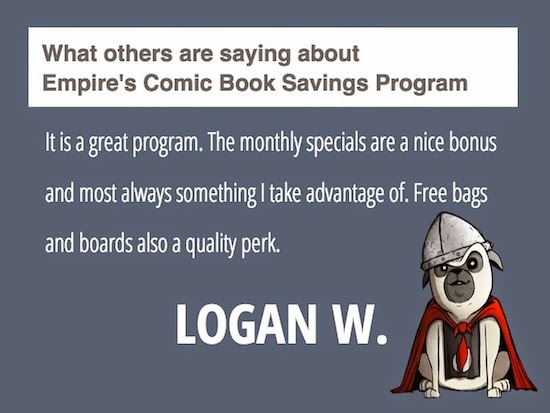 "Love the monthly benefit, but honestly I'd have a pull list anyways! Having some books set aside on FCBD was truly excellent though, so I could make sure I got some that I was really pumped about." "I think it's fantastic! I never have to worry about missing out on the books I read and I'm comforted knowing that if I have to wait a while to pick 'em up, Ben totally has my back and won't put my stuff back on the shelf. Oh, and the coupons, sales, promos, etc.. why, they're the ultimate icing on the cake!"